Professor Trevor Duke is the director of the Centre for International Child Health, University of Melbourne and clinical director of the general intensive care unit at Melbourne's Royal Children's Hospital. He is also the Adjunct Professor of child health in the School of Medicine at the University of Papua New Guinea, a member of the PNG National Child Health Advisory Committee, and previously a provincial paediatrician in Goroka. Trevor is head of the World Health Organization's Collaborating Centre for Research and Training in Child and Neonatal Health, and co-principal of AusAID Knowledge Hub for Women's and Children's Health. He was involved in designing the WHO / UNICEF Child Survival Strategy and the International Child Health Review Collaboration [www.ichrc.org](http://www.ichrc.org/). 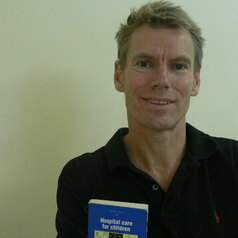 He is an author and editor of the WHO Pocketbook of Hospital Care for Children. Trevor annually compiles the publication Randomised trials in child health in developing countries, which is distributed free of charge to over 2000 health workers, academics, professional societies and organisations throughout the world. Particular interests include the epidemiology and case management of acute respiratory infections, improving the quality of paediatric care in district and provincial hospitals, oxygen and hypoxaemia, disease surveillance and auditing, neonatal care, meningitis, and childhood tuberculosis.